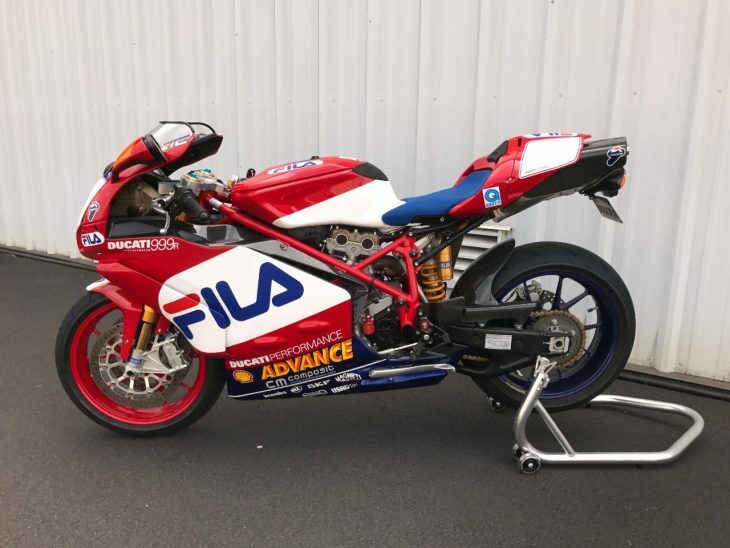 Hmmm...the seller lists this one as a 2003 Ducati 999R FILA edition but a few things seem odd, including the year listed and the graphics. Perhaps someone with more direct experience can advise in the comments section...? 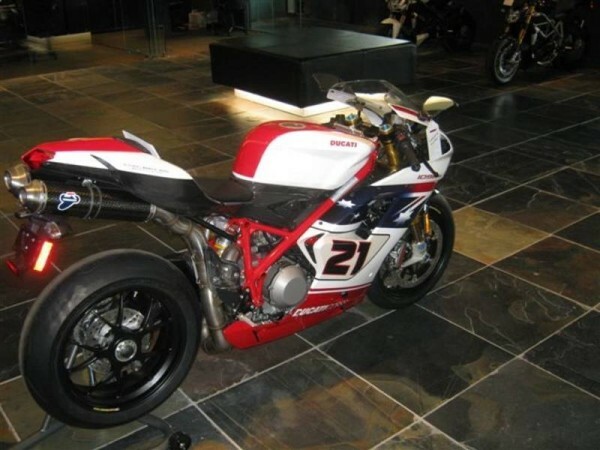 First a bit of history; back in the early 2000's it seemed like every new Ducati sportbike had a minimum of 3 different versions plus a commemorative edition. 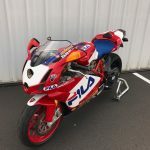 There would be a basic/strada street version, a mid-level bike S bike with some upgrades still intended for street riders and finally a top level R bike that, while still street legal, included lots of track oriented tech. 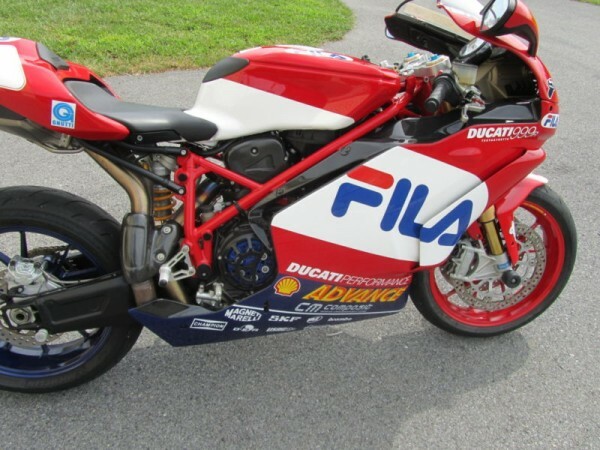 Any commemorative editions would typically be based on either the S or R level bikes, although occasionally they were even done at the standard/strada level (I'm-looking-at-you-Nieman-marcus-edition-Ducati-749). 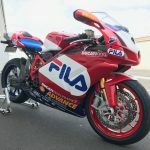 The Ducati FILA editions were based on the top level 999"R" and were introduced in 2004 to celebrate Ducati's 200th win in the World Superbike Championship (note: there was also a James Toseland FILA edition in 2005). 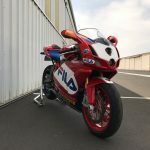 The FILA editions came with carbon-fibre bodywork, lighter engine internals, upgraded injectors, a lighter front and rear sub-frame and Ohlins front and rear suspension. 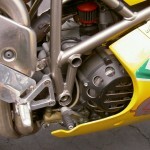 The changes added added up to about another 40HP from the basic/strada 999. 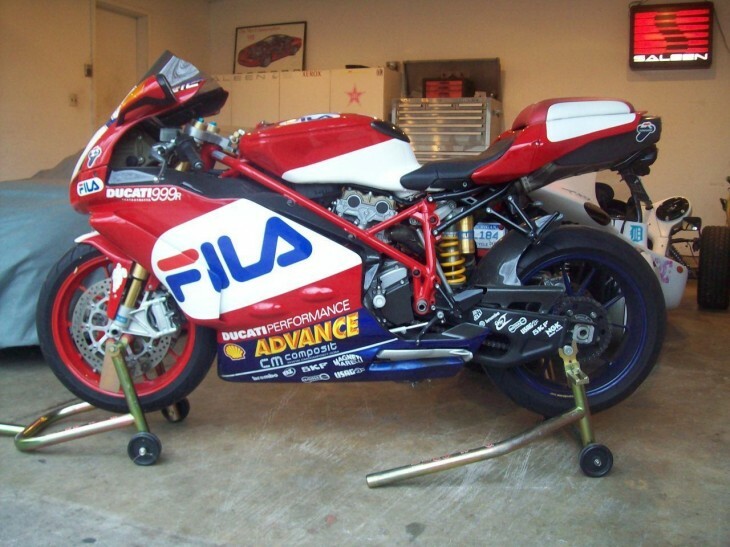 The FILA edition also had another advantage over the strada and S versions; it looked much better. 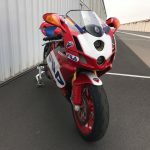 When the 999 was launched many people found the design to be a step back from the predecessor 998 (which was an evolution of the Tamburini penned 916). 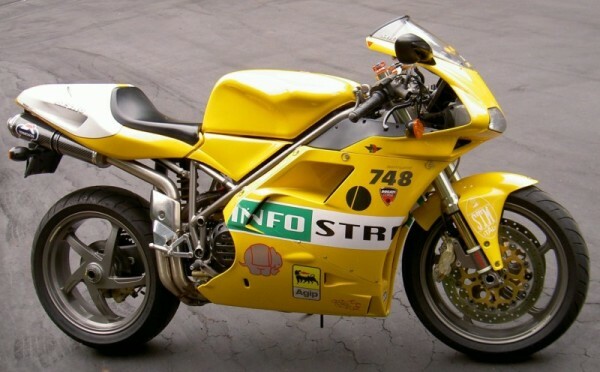 To many people the initial versions of the 999 looked unbalanced, with full fairings on the front but an exposed trellis frame and odd small rear fairing. Fortunately versions such as the S based Parts Unlimited and R version FILA and XEROX editions met with much more approval. 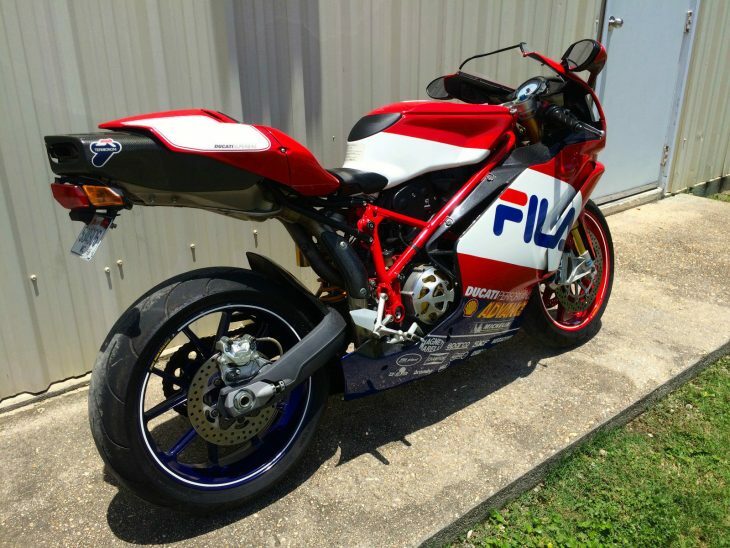 This particular bike is listed as a 2003 Ducati FILA edition and at it looks clean with no indication of having been abused ordown. 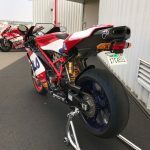 The only non-stock items I noticed were the chain and wheel stripes (which might be decals) and possibly the license plate hanger/tail unit. 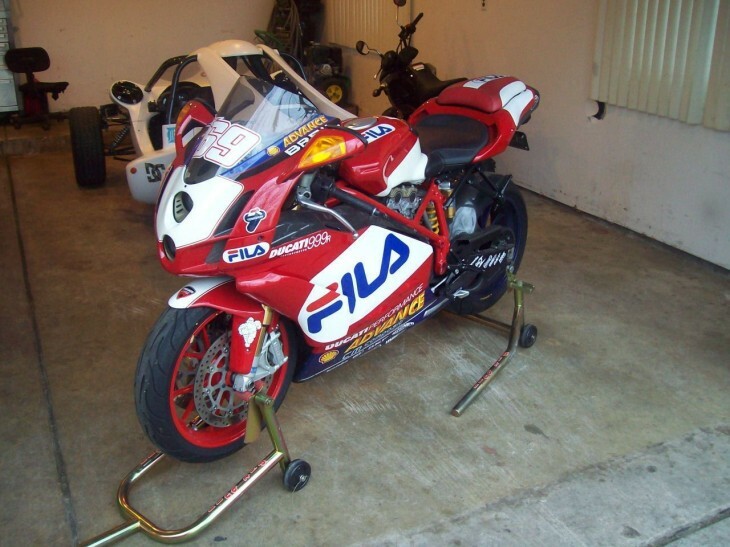 However a closer review did raise a few questions, including why is bike listed as a 2003 FILA edition? 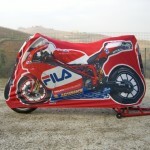 From what I remembered and what I found on the web, the FILA edition was offered from 2004-2006 but not in 2003. 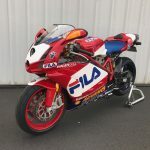 Also the decals on the front fairing/windscreen area and gas tank do not seem to match to the standard FILA edition decal layout and what have seen on previous 999R FILA editions here on RSBFS. 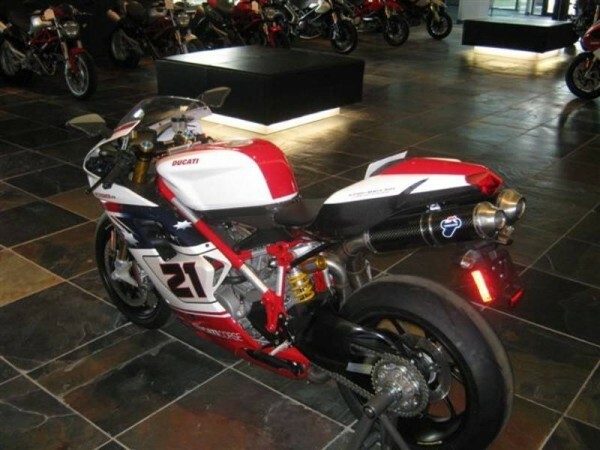 Its possible they were removed by a previous owner but since there was also a general 999R in 2003 so its also possible this bike has undergone a bodywork and/or wheel change by a previous/current owner who didn't like the look of the standard bike. 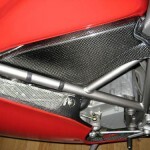 Never been dropped but very small nicks in paint on lower fairing. 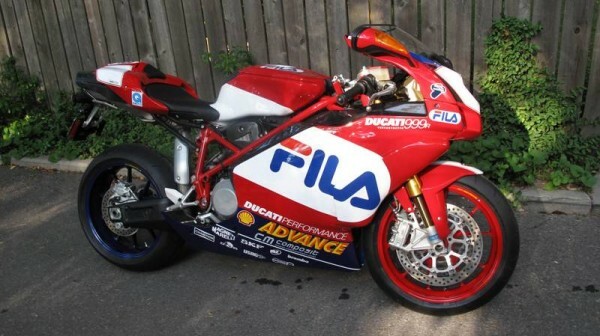 So what is the 2003 Ducati 999R FILA-badged beauty worth? Well it certainly looks to be in very good condition and the current bid price is about $5,400 USD with 3 days to run (reserve is not met at this time). 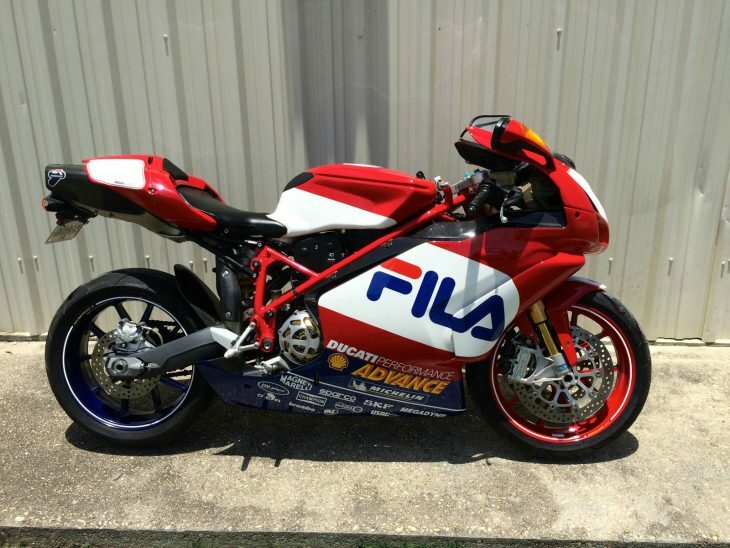 Prices for a Ducati 999R FILA editions seem to be hovering between 12k-15k USD (which is about 1/2 of their original asking price) and for this one I would expect reserve to be right in the middle of that range given the mileage and condition, provided it can be confirmed to be an actual FILA edition. 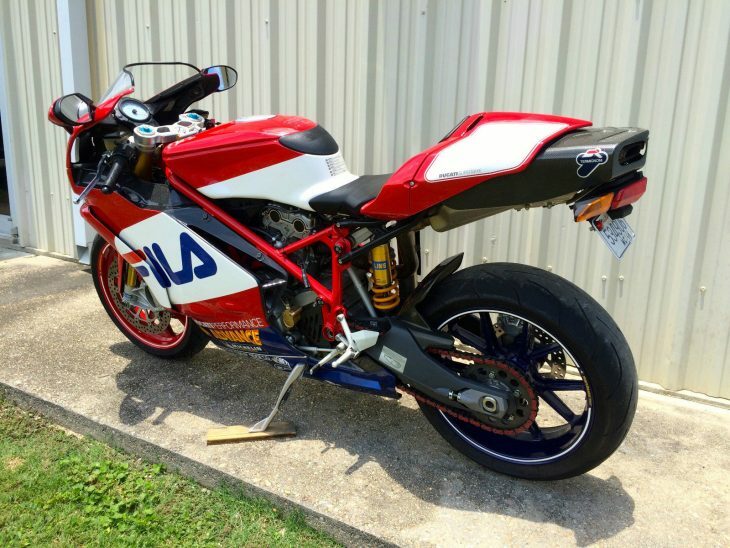 Overall this appears to a good Rare Sportbike but I am not sure it will appreciate over time. 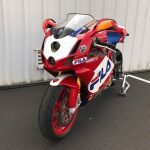 Also any serious collector would need to contact the seller regarding whats going on with the fairing decals and perhaps perform a VIN check? 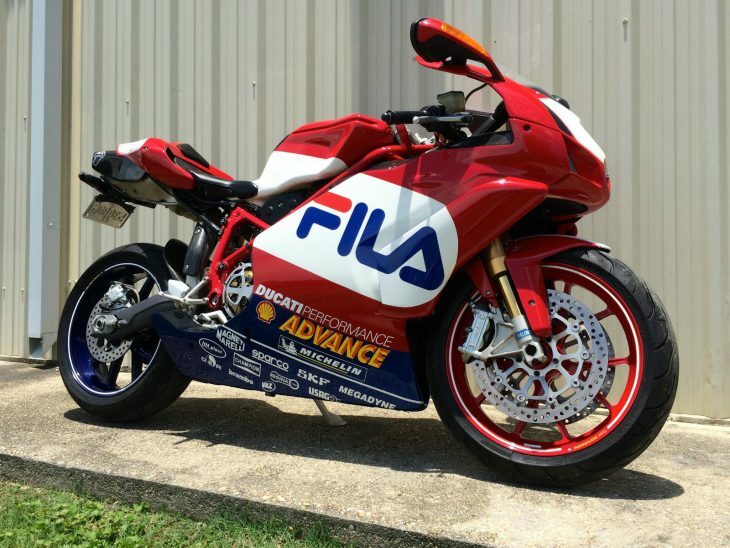 When the 999 came out as the replacement for the 916/996, a lot of people found the new styling by Pierre Terblanche (who also did the MH900e) too weird, too avant-garde... but the FILA package for the 999R certainly improved the looks. 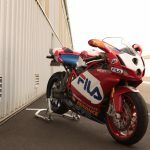 The FILA edition 999R was produced by Ducati in 2004 to celebrate its 200th win in the World Superbike Championship and was a limited edition production run of 200 special versions of the Ducati 999R in the official 2003 FILA livery. 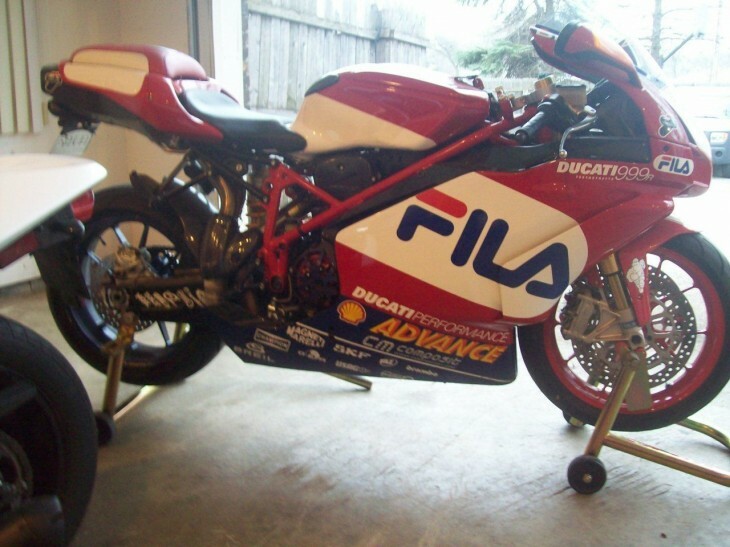 This particular FILA edition is located in Detroit MI (brrrr!) and the seller seems to have made some upgrades including the full 57mm Termi system and new Michelin pilots. At $13,500 it is within $500 of KBB retail, so the seller seems to be reasonable. Maybe snap it up before springtime comes. 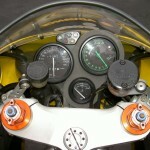 Sometimes it seems that the nicer, more rare and more expensive a bike is, the less the seller has to say or show about it. 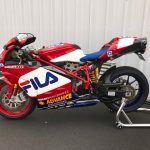 While the age-old adage of "it sells itself" may be true, the staff here at RSBFS really like to see an owner who is willing to share what they know about their bike. 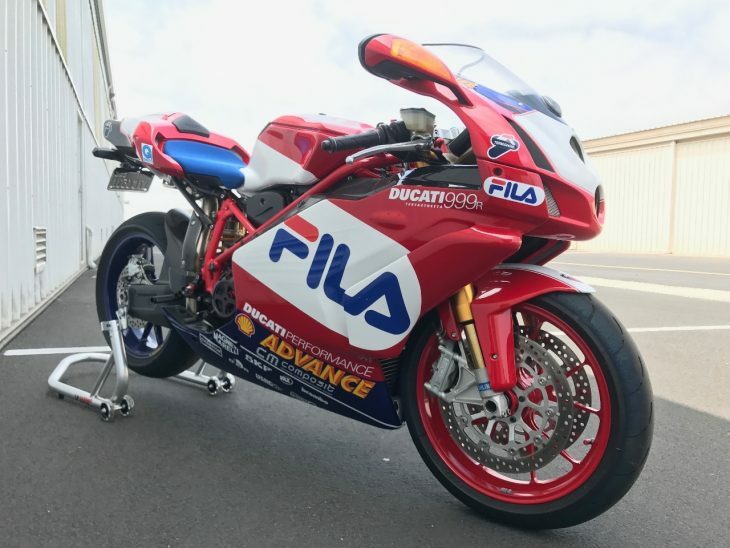 This 2004 Ducati 999R in the Fila livery is certainly rare - and with a BIN of $23k it is certainly expensive - but I would have hoped for more than a single picture and a short description. 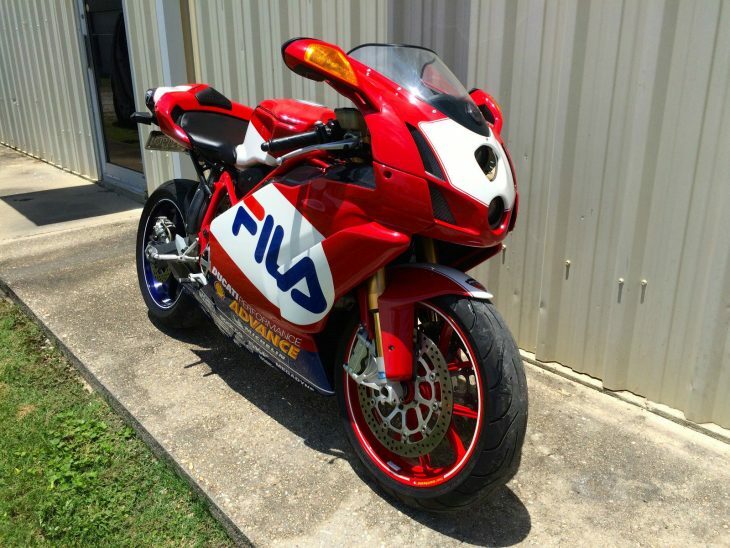 2004 999R FILA 'JAMES TOSELAND' REPLICA - ORIGINAL DUCATI FACTORY BIKE SERIAL NUMBER 93 OF 200 MADE; ONLY 70 BIKES CAME TO USA. ALL ORIGINAL WITH RACING FACTORY TITANIUM EXHAUSE AND COMPUTER CHIP. 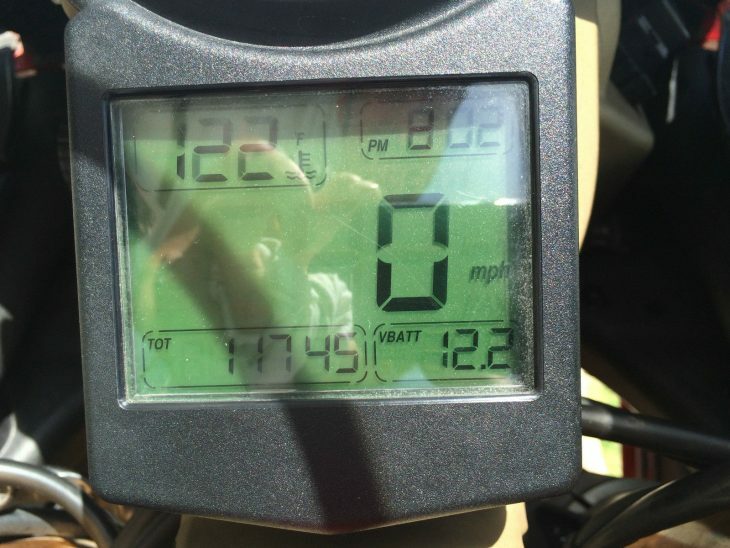 ONLY 4,404 MILES. TRUE COLLECTOR'S ITEM. MORE PHOTOS ON REQUEST FROM SERIOUS BUYERS ONLY. If that little teaser makes you interested, click on the link and jump over to the auction. Contact the seller for more pictures and details - but if you do, make sure you tell us about it. Good Luck! 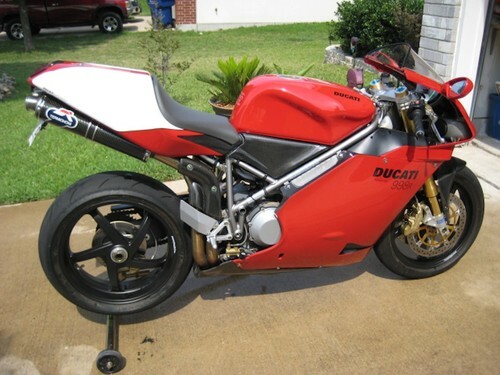 Check out this group of 3 late model Ducati superbikes for sale from the same seller. 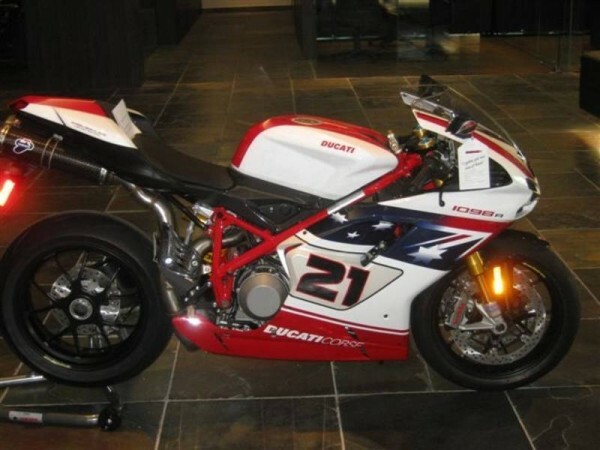 Heck, throw in a Hailwood & 888 SPO and you’ll have a sweet chronology of Ducati Superbikes. These bikes all appear to be in great condition, so let’s look at them individually. 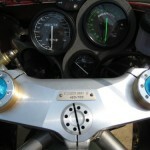 The 998s Bostrom is especially unique in the lack of miles it has accumulated through the years. 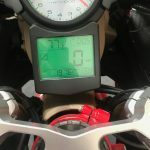 Although we have seen a fair amount of Bostrom replicas on RSBFS (here), few have matched the low miles on this example – less than 1,000 miles! Although I love this model and the low mileage on it, the price at $25,000 U.S. dollars seems very optimistic to me. 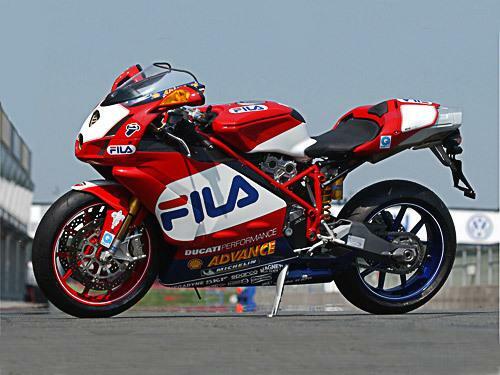 Ah the forgotten Ducati, the Fila 999R. 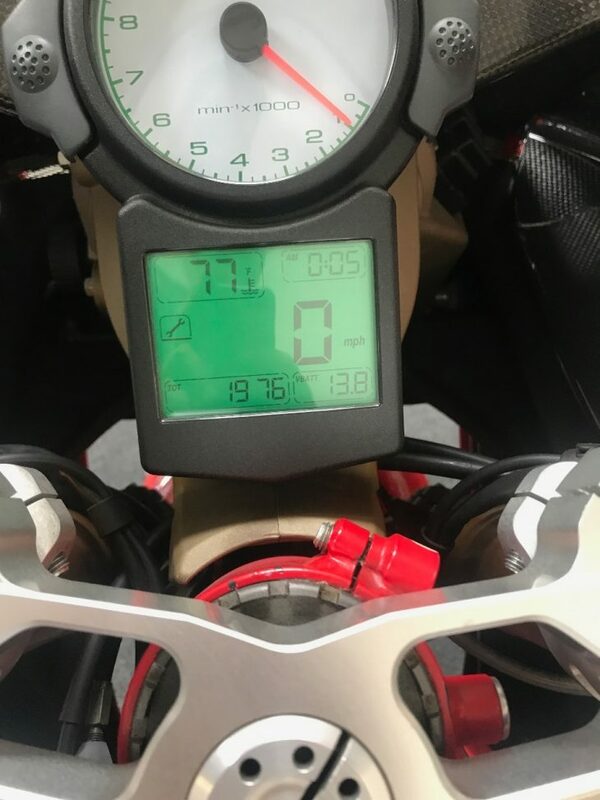 Most Ducatisti will fondly remember the 916/996 series and most will also admire the handsome 1098/1198, but few cherish the 999. 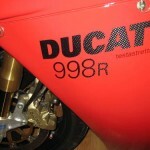 In some ways this bike never had a chance; following the 916 is no easy task. 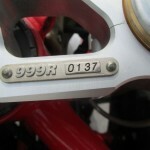 This bike is especially remarkable in that it is brand new – only 8KM! 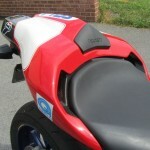 The price is virtually identical to the Bostrom, but this one is NEW. 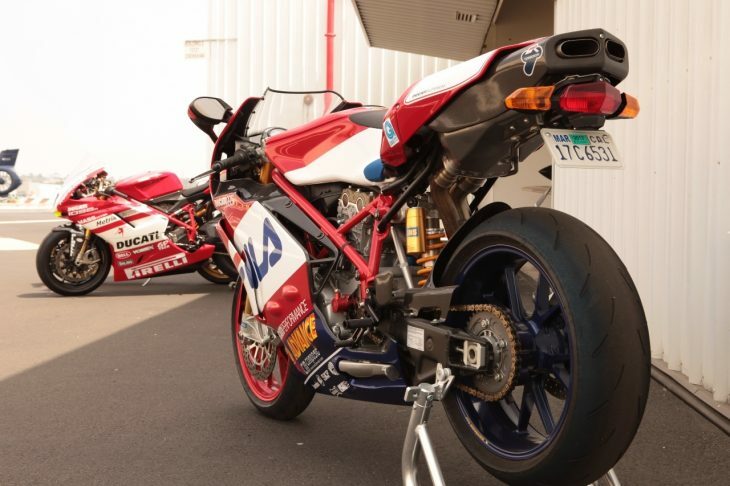 On to the crown jewel of this trio – the 1098R Bayliss Replica. 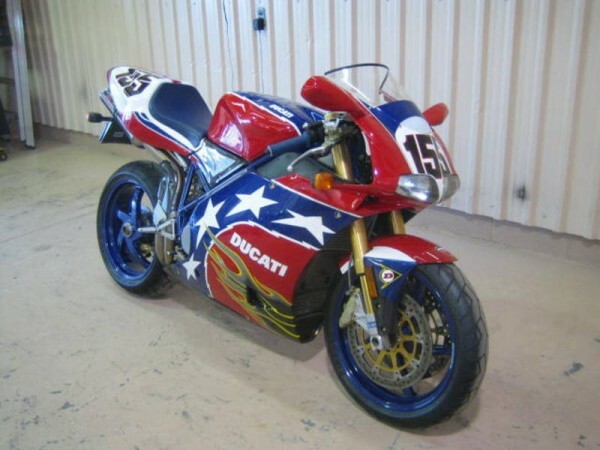 This bike is also brand new and nothing short of stunning. 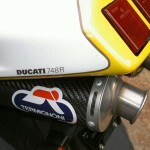 The Bayliss bike has been crippled from the get go by a weak economy, weak US dollar and aggressive pricing by Ducati. This convergence of factors led to an abundance of new or like new Bayliss bikes, similar to this one, selling way below MSRP right off the showroom floor. I hope someone goes big and picks up all three.